Wrongful Death Statute of Limitations in Texas - Do You Still Have Time? There are two claims under Texas law that allow people to recover after they have lost a family member in an accident – a survival action and a wrongful death action. The statutes of limitations associated wrongful death and survival action claims are discussed below. Wondering if You Still Have Time to File a Wrongful Death Claim? The Texas Survival statute allows an executor or estate representative to pursue a claim on behalf of the deceased person for certain elements of damages, such as pre-death conscious pain and suffering. For medical claims a special statute applies and it is two (2) years from the date of the malpractice not the date of death. The statute for a survivorship action is 2 years. 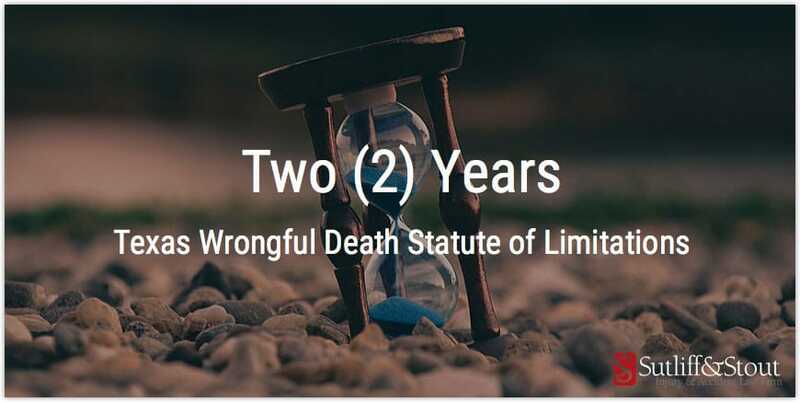 Generally speaking, the statute of limitations for wrongful death claims in Texas is two years after a person’s death. It is important to note that in very limited circumstances a different statute may apply. This is why it is essential that you discuss the specifics of your case with a qualified wrongful death attorney. Wrongful death claims are often extremely complicated and highly contested, so it is important for surviving family members to give their attorneys adequate time to prepare their case. Some issues associated with preparing a wrongful death case include investigating the incident, preparing documents to file with the court, and assessing potential damages. In most cases, if a claim is not filed within the statute of limitations, you will give up your right to seek compensation for your losses. Wrongful death cases are no exception, and surviving family members who fail to file their claim in a timely manner can often miss out on hundreds of thousands of dollars in compensation, if not more. After the sudden death of a loved one, family members are most likely grieving and trying to make sense of the loss they have experienced. In addition, the tasks associated with arranging a funeral and wrapping up a person’s affairs can be extremely time-consuming and emotionally difficult. You only have a limited amount of time after a death to file a claim, so it is extremely beneficial to retain a wrongful death attorney to handle a wrongful death claim on your behalf so you can focus on your own grief and obligations. If you have lost a loved one because of the negligence or wrongful conduct of another person, you should not delay in speaking with an attorney. These kinds of legal actions can take months to adequately prepare, so it is important to retain legal counsel as soon as you realize that you may have a claim. To schedule a free consultation with one of our Texas wrongful death lawyers, call Sutliff & Stout today at 713-987-7111.